The advent of television, and later the internet, has flooded the world with a variety of media. Of all these various forms of media, radio, with its unique presence, remains as one of the best ways to connect with the world. Radio is a world that can be experienced only in real time, where we can meet new music and listen to engaging conversation between interesting personalities. 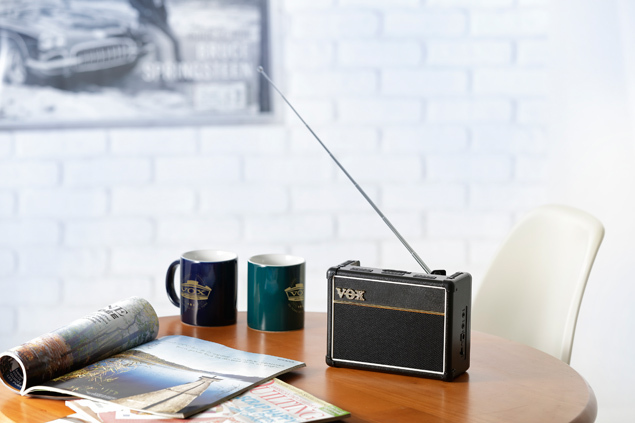 Based on the looks of the classic VOX AC30, the AC30 Radio is perfect for tuning into your favorite station whether you be at home or on the go. The AC30 radio can provide background music for your daily life, be used when relaxing before going to sleep, and can be used as a way to get informed when you need it most. The compact and battery-powered AC30 Radio meets all of your listening needs. The AC30 Radio is also a great decoration for any VOX fanatic and will be loved for years not only by guitarists, but all music fans.